Back in 1966, the Batman television program starring Adam West and Burt Ward was one of the most popular shows around. Now West and Ward have teamed up once again for Batman: Return of the Caped Crusaders. 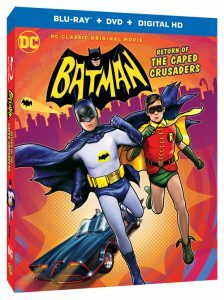 As the title suggests, Batman and Robin are back in a brand new adventure, in an animated direct-to-DVD (& Blu-Ray) movie starring Adam West as Batman, Burt Ward as Robin, and Julie Newmar as Cat Woman. All of these actors are reprising their roles from the classic television series to give you another exciting Bat-action story, reminiscent of the what made the show famous and memorable. What makes this movie special is its style of animation that is reminiscent of the original Batman ’66 show, yet enhances the appeal with the stunning visuals for which Warner Bros. Animation is famous. The movie captures all of the great elements for which the Batman ’66 show is known, such as fight scenes with classic sound effect balloons, and the signature tongue-in-cheek humor that was considered to be family-friendly during that era. The original cast of the show also helps make the movie feel authentic and special; this alone can make fans of any age appreciate their work. Another thing that makes this movie special is seeing the story move in the direction in which the show was never able to go. This helps make the movie a unique experience for viewers, yet can be appreciated by all Batman fans. While the movie still has the campy story style of the television show, it has a story that doesn’t undermine the viewers perspective of the original Batman ’66 or Batman we know now. If you’re a fan of the original TV show. or just a fan of Batman in general, this is a movie you probably won’t want to miss. 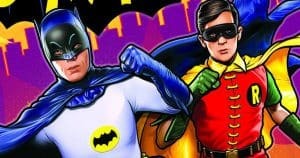 This film gives us the charm the original show has to offer, along with a number of nifty Easter eggs that are a throwback to the original Batman ’66 tv show. n my opinion, this is a Bat-tastic movie for fans of any age to appreciate the show all over again. Are you a fan of Batman ’66? Join the conversation on FoCC!